Follicular hair transplantation in Gujrat, Pakistan) is a surgical procedure in which small plugs of hair-bearing skin containing 2 to 3 hair each are taken from the back or sides of the scalp and transferred to the bald area on the head. The area from which the grafts are taken (donor site) is first treated with a local anesthesia followed by removal of the desired number of hair grafts. The area that is to receive the grafts (recipient site) is similarly treated and the donor grafts are carefully placed into the prepared area in a pattern that matches the direction of the original hair. The transplants are spaced in such a way as to allow each to receive an adequate blood supply during the healing process. The procedure lasts for 3 to 6 hours depending upon the condition of the skin and extent of the area involved. About six months later, the spaces between the new implants are filled in with new grafts. About six weeks after each transplant, the hair falls out. Approximately three months later, new hair appears and grows at a rate of one quarter to one-half inch a month. Mega session consists of more than 3000 follicles (7000 to 8000 Hair) in few hours at GHT Hair Transplant Center In Gujrat Pakistan. What types of baldness can be helped by this procedure? There are many causes for hair loss in men and women including high fever as a result of severe infection, thyroid disease, inadequate protein in the diet, certain medications, cancer treatments, childbirth, birth control pills and others. Many of these conditions are reversible and do not require hair transplantation. The most common type of baldness that is successfully treated with hair transplantation is male pattern baldness. This condition, inherited from either side of the family, starts when a person is in his or her teens, twenties or thirties. While women with this inherited tendency do not become bald, they can develop considerable thinning of the hair. Other types of baldness that respond to this procedure are those which have resulted from accidents, operations and inflammatory or infectious diseases of the scalp. Following the initial treatments, many patients who want to achieve greater density or refinement of the hairline will return for additional transplants. The technique Now a days which is effective for the treatment of baldness is singleFollicular Hair Transplantation. For the last few years this technique becomes even more better due to rapid progress in this field. Use of stereo-microscope so that follicles can cut in a complete unit. Planning of sessions of HT as baldness progresses. Most Important is to have a trained team of HT with surgeons. Progress in the technique of local Anesthesia due to which HT becomes a painless procedure. This progress is excellent and characterized by natural and definitive results. The most important aspect is patient’s satisfaction after single follicular hair transplantation. This latest Single Follicular Slit Graft Technique is a surgical procedure based on the fact that hair follicles from side and back of the head are genetically programmed to grow. With this new technology, we transplant one hair at one time. The final result is Guaranteed Healthy 100% naturally growing hair withno scars and no side-effects. The result is obvious in 3 to 6 months. 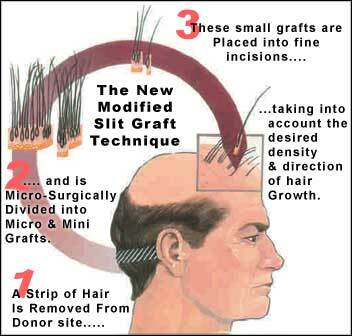 The growth of the transplanted Hair is 1cm per month. The new hair grow like normal hair and you can cut these hair regularly.